What is motivating your clients? Chip Conrad explains why discerning their motives is the first step of realistic goal setting. There will be physical goals and there will be metaphysical goals, all stemming from the physical place—from movement and from strength. When I’m talking about the seven levels of goals, it’s not a Maslovian hierarchy. It’s not like you have to meet the first to go to the second. 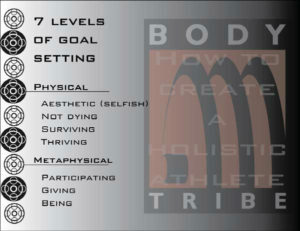 You’ll just find somewhere your goals will fall on one of these levels—physical or metaphysical. The first four goals are physical. The very first level is selfish. If you’re a trainer or you’ve been in a gym for any length of time, you’ve seen this. I got started by fitness magazines. There was no internet, except for maybe Al Gore and a few merry pranksters who were running bulletin boards back during the time when I got started doing this. My experience, when I first started moving and lifting, was reading bodybuilding magazines. Bodybuilding magazines, if you remember back in the 80s, 90s, and even until now, run the same basic three articles over and over again—the six-pack, something about nutrition and how to get bigger arms, a chest or whatever. It’s the same articles recycled over and over. That’s how I started, and that’s how a lot of people started. Remember, I talked about goal setting as being an experience. Bodybuilding magazines were our experience. All we saw was Arnold or whoever was in those magazines at the time. That’s as far as our experience went, so all of our goals were based on that. To a point, they still are for a lot of people—what the mirror says and what the scale says . . . very selfish goals. I’m not here to judge that. Go for it. If you want that to be your source of motivation, more power to you. I’m not here to judge. Go for it, but you’re not going to be entirely useful on that path.